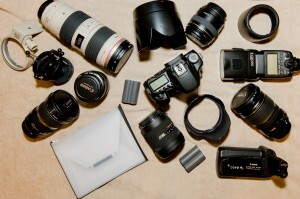 For some inexplicable reason, I seem to get asked a lot about photo gear. Maybe it’s because I occasionally get to play the part of the professional photographer, perhaps it’s just because I always seem to be carrying around a very expensive camera and seem to know how to use it. This is a camera that I have not commonly been seen with. My first foray into the world of SLR (single lens reflex) cameras was this trusty Minolta. Delightfully fiddly, everything on it was mechanical. The lightmeter required a button-battery to be installed in the body, but the camera could operate without it (but you’d have to guess the exposure). I’ve shot several skating events in Australia with this camera and a lens whose specifications I cannot recall. Obviously, this was a film camera, and I have boxes packed to the brim with negatives to prove it. My SLR adventuring took an extended break when digital cameras became prominent. I went through several digital point-and-shoot cameras and almost forgot my love for photography until I was traveling through South America. When one finds oneself on a 5-month backpacking tour of a continent such as South America, one finds that one has many opportunities to take photographs. After a few months on the trot, I was starting to feel limited by the abilities of my (admittedly very good) point-and-shoot Sony DSC-N1, a 10 megapixel camera with a touch screen. Unfortunately, when one is traveling, one is generally on a somewhat limited budget and my decision to dive into the world of digital SLRs could not have come at a more inconvenient time. I was in Bolivia… and my next stop was Paraguay. Neither of these countries possessed a shop which would sell many DSLRs. Even if they did, it would be difficult to gather enough cash together to purchase one. After Paraguay was Brazil, so I planned to make the purchase in Sao Paulo, a city of 20 million people, and the center of commerce in Brazil. Fortunately, I was able to get internet access while in Brazil, so I was able to research my purchase. At the time (early 2007) the market for entry-level DSLRs was just beginning to heat up. The incumbent was the first sub-1000USD DSLR ever – the Canon EOS-400D, also known as the Digital Rebel XTi. The challenger was the Sony Alpha-100. Both had almost identical specs and prices. The Canon had the advantage of being one of the two big players in the DSLR world (the other being Nikon) so it had a very wide range of lenses and accessories to choose from, as well as a very clear upgrade path in the unlikely event that I should wish to continue pursuing my passion for photography. 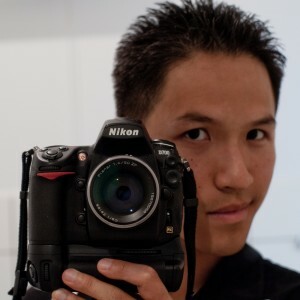 Sony, however, had just bought out the DSLR division of Minolta and were just starting out in the DSLR business. 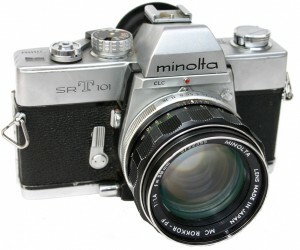 That meant that it didn’t have a huge range of lenses, or a medium or high-end camera to upgrade to at the time, but it meant that old Minolta lenses would mount on Sony cameras. Nikon wasn’t even on the menu at this stage, because it’s entry-level model, the D40, only had 6 megapixels (the 400D and A100 both have 10), and none of the shops in Sao Paulo stocked Nikons anyway. In the end, the Canon won out. I figured that my dad (the previous owner of the Minolta) was too frugal to have bought any good lenses (this proved to be correct), and the availability of Canon accessories made this the best choice for me. I bought the camera body in black (silver looked very tacky, in a bad way) with a battery pack (because I knew that I would have to go for long stretches between access to electricity) and the EF-S 17-85mm f/4-5.6 lens. At the time, I only really understood what focal length meant, and had no idea about aperture (the numbers after the “f”). I was instantly happy with my purchase, and didn’t experience any buyer’s guilt. Owing to lower pixel density on the sensor (more on that later) there was much less noise, and pictures in low light were subsequently much more usable. All the controls that come with a modern SLR camera were a delight – the ability to control exposure through shutter speed and aperture, and the very tactile feel of twisting a zoom lens all contributed to a much better photography experience. The 3 frames-per-second continuous shooting also allowed me to capture certain things better, like a glacier calving. For those dedicated danielyeow.com readers who were following my exploits in 2007, the point at which the camera switch happens is just as I arrive in Rio (you probably noticed). From then on, I took photos at a much increased rate. I started the trip on the 11th of January, and took about 6,000 photos between then and the 8th of May (when I got the camera). Between the 8th of May and the 12th of June (the end of my trip), I took about 6,000 photos (although, to be fair, I also saw stuff at an increased rate towards the end of my trip, but even allowing for that, I was much more shutter-happy). Apart from having manual control over the parameters of the photos, the advantage of a DSLR lies in the image sensor. It’s easy to get caught up in the megapixel-war that camera manufacturers have manufactured. Just for reference, 6 megapixels is enough for a 10cm by 15cm print, 10 megapixels is plenty for an A3-sized print, and 25 is good enough for a large poster. 25 megapixels is also roughly equivalent to the resolution of film, and when I say “film” I don’t mean the cheap stuff you buy from the street vendor outside Ankor Wat, I’m talking about really good film, like Fuji Velvia. If all you ever want to do is put photos on the web, you never need more than 4, if you’re sending photos to a newspaper, you’ll need 8-10, and if you’re putting things in magazines and coffee table books, you’ll want as much resolution as you can muster. Megapixels aren’t everything. My Sony DSC-N1 and the Canon EOS-400D both had 10 mp on the sensor. The crucial difference is that the Sony’s sensor is about the size of my little toe’s toenail, while the Canon’s sensor is the size of a small postage stamp. This means that each individual pixel gets more “space” and experiences less electromagnetic interference from adjacent pixels. That might sound ridiculous, but when you put 10 million light-sensing dots on an area the size of a toenail or postage stamp, these things add up. When you have a lower pixel density, it also means that the image doesn’t have to be focused on such a small space, which is slightly less demanding on the quality of your lenses. Another small technical detail that made me choose the Canon over the Sony was the type of sensor. The Canon sensor is a complementary metal oxide semiconductor (CMOS), while the Sony’s was the more common charge-coupled device (CCD). CMOS sensors are usually only found on the high-end cameras because they have a higher rejection rate in manufacture. They also dissipate less energy than CCDs which means that they’re a bit better for battery life, and they have slightly better light sensitivity. Sadly, my experience with the 400D was cut short in Colombia. While attending and participating in the 2007 world inline speed skating championships, my laptop, camera, ipod, and cash was stolen from my locked hotel room (which was, mysteriously, still locked when I came back). I thus had to journey from Colombia straight to New York without a camera, and live without a camera for a nontrivial amount of time. In the intervening time, I was able to plot my next move. In September 2007 Canon released the EOS-40D, which was very much NOT an entry-level camera. Mostly the same specs, but a larger and more durable body, slightly more advanced image processing circuitry, and a staggeringly quick 6.5 frames per second continuous drive. I also finally figured out what aperture meant. The number after the “f” is simply the focal length divided by the diameter of the pupil. In laymans terms, a smaller number means more light goes through. This helped explain why lenses with small “f” numbers were so much more expensive. 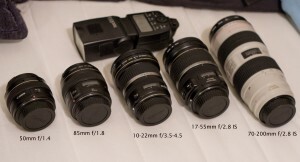 So I set about collecting a range of lenses to cover a wide range of focal lengths as well as getting some lenses which had very low “f” numbers. I added a good external flash to my arsenal at which point I realized that, in bang-for-your-buck terms, a good flash is a better move than a better lens (trust me, taking time to understand and experiment with light and how it affects your photography is the best thing you can do to improve it). Around the time I was completing this collection, I also took my photography to another level when I joined the staff of the Columbia Daily Spectator. Shooting assignments gave me the prefect opportunity to practice my skill. The assignments were varied, presented new and interesting challenges that I would not have normally encountered, and often had very tight deadlines to be met. I was flabbergasted when my first assignment appeared on the front page the next day, and I also broke some kind of unofficial record for fastest promotion to the position of staff photographer, although to be fair, I joined at the beginning of second semester, during which there is less competition among new photographers for assignments. At this level of photography, there is just about no excuse for not getting technically good photos, which is why I am always surprised when complimented on my ability as a photographer. Between all of my lenses, I had almost the full range of focal lengths covered, including a 180-degree field-of-view fisheye lens. In addition, a perk of having the resources of the Spec, is that we have the occasional guest speaker in the form of Ed Keating, a two-time pulitzer prize winner from whom a young and inexperienced photographer can learn a lot (and perving on his Leica MP camera was fun too). Where do you go from there? Well, it’s all about the sensors, and technology moves at a scarily fast pace. 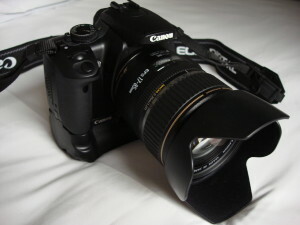 The 40D, with its specifications, costs just under 1000USD for the camera body (no lenses) at the time of writing. As recently as 10 years ago, a film camera body with equivalent specifications would have cost upwards of 5000USD, and it wouldn’t have been nearly as user-friendly. Current sensor technology is superior to film in many ways, especially in regards to light sensitivity. So far, the only thing that has been lacking is that the sensors in most DSLR cameras are usually about 24mm by 16mm – slightly smaller than a piece of film (36mm by 24mm). The advantages of having a larger area over which to spread your pixels has already been stated above, so why aren’t all DSLRs made like this? Well, it’s expensive to do, and the rejection rate is very high in the manufacturing process. Full-frame (as it’s called) cameras are also usually slower than their APS-C (referring to the type of film with the same dimensions) counterparts because the shutter mechanism has to move a larger mirror out of the way. Lenses have to be larger and heavier (read: more expensive) because they need to focus the image onto a larger space. Also, and this was never a problem with film, more data needs to be processed simply because there are generally more pixels on the sensor. But as I mentioned above, technology moves very fast, and by about September 2008, I was ready to move with it. By this stage in the game, Nikon had finally got their act together and entered some seriously good contenders into the entry-level and pro-sumer markets (the Canon EOS-40D is considered a pro-sumer camera). Generally more expensive, but with build quality to match, Nikon had fallen behind Canon mostly because it didn’t make full-frame cameras, and its other cameras were considered expensive for what you got. Then they pulled a fast one, and released the infamous, game-changing D3. The D3 was full-frame, could shoot 9 frames per second, and (here’s the kicker) had 12 megapixels. It seemed unusual that Nikon’s new flagship model would come with only 12 megapixels, especially when Canon’s equivalent, the 1Ds Mark III had 21, but Nikon did a very clever thing by not competing directly with Canon, but offering a similar, but slightly different camera with different advantages. 12 megapixels on a full-frame sensor leads to a ridiculously low pixel density. That means that the sensitivity in low-light is a touch absurd. How absurd? Consider film, which used to get grainy if you went above 800 ISO (higher numbers are more sensitive), then there’s digital point-and-shoot cameras which produce unusable photos after 400 ISO. Most DSLRs produce usable photos up to 1600 ISO. The D3 produced usable photos all the way up to 64000 ISO, and marginally usable ones up to 128000 ISO. That camera body costs about 5000 USD, which was a bit beyond my budget. Months later, however, Nikon released the D700, which was a smaller, cheaper, and slightly slower D3, and this one only cost 3000 USD. After doing some calculations, I figured that I could sell all of my Canon gear, and a few pieces of furniture, and be able to afford the D700 with three top-quality lenses. So that’s exactly what I did. I was also very sneaky and didn’t tell anyone that I was replacing my camera, instead opting only to inform them that I was selling my old gear because I was moving overseas (the truth, but not the whole truth). The truth was eventually revealed at my going away party to the machine-gun sound of 8 frames per second in a dimly-lit room where we made merry and sang kareoke. So, at the end of the day, I had a few less lenses to play with (I do miss my fisheye), but I have a much faster camera, an infinitely better auto focus system, and a weather-sealed one (I can shoot in very heavy rain if I ever need to). 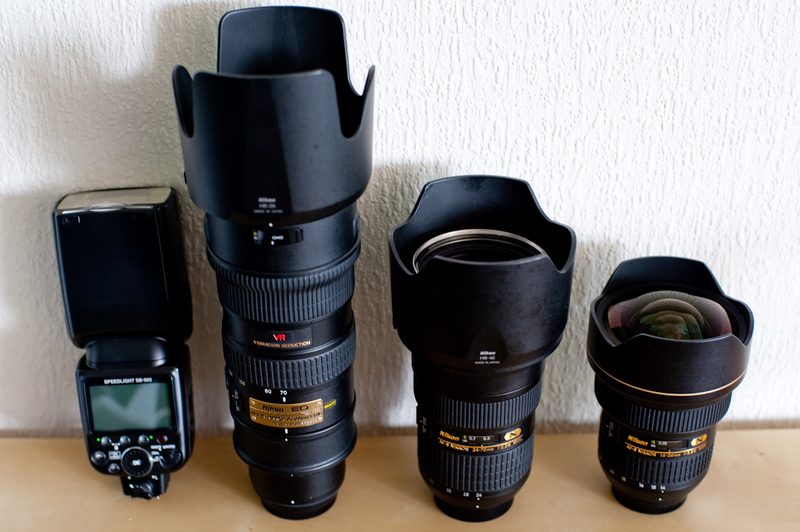 The Nikon lenses are also professional-grade with weather seals on all the moving parts and joints. I use Tiffen high-transmission filters on the front of all my lenses to protect the front lens element from scratches. Although I have done professional work, and have also sold many photos to newspapers, magazines, and the occasional book, I’m certainly not making any money from this “hobby” of mine. To this end, I am considering starting a satelite site to showcase and possibly sell photographs that I take (and I do take a few). If anyone has any suggestions or experience with this, I’d love to hear about it. Nice post, and great explanations! Great camera and lenses btw – I don’t have the 24-70 or the 70-200, but the 14-24 is one amazing lens – just made for the D700… How’s the 50/1.4 Zeiss treating you? Hi Dave, yeah, the 14-24 is so cool. The amazing thing is how it has almost no barrel distortion, which is crazy for such a wide lens (and at f/2.8!!). The Zeiss is awesome. It’s some of the sharpest glass I’ve ever used and the build quality is second to none. Having an f/1.4 manual focus is tricky though, because it’s very easy to get things out of focus because the plane of focus is so narrow. But 50mm on a full-frame actually works very well (I tried it on the APS-C, and its uses are a bit more limited).